Showing results for tags 'apple family'. We all waited so long for this story. Another week which means another episode full of the adorable ponies we all know and love! Or in this case two! A day late and a dollar short, but here is the official thread! Anyway, now on to the second episode of Saturday! A Perfect Pear! Six years we have waited for the story of Applejack's parents, six years we wondered what they were like and filled the fandom with headcanon, well now the official answer is here! This episode was absolutely wonderful and the biggest tear jerker, so prepare! This thread is dedicated to discussing the episode before, during, and afterwards. As the thread is now open it may indeed contain spoilers. As the episode has already been widely aired, there is no need to bother with spoiler tags, just chat away! Inside the grand ballroom everything was going along as a gala always tended to; ponies dancing, nibbling on treats, conversing in low tones. It was a dignified affair, full of Canterlot's finest along with dignitaries from across the world all dressed up fancy and trying to impress each other...all that hoity toity nonsense was enough to make you head for the hills...however, there appeared to be something coming out of the hills... Dust puffed up from the carriage stop area outside the castle grounds. Whooping and hollering could be heard from all around. Two wagons ulled up and halted. When the dust cleared bunches of hooves hit the cobblestones as the passengers unloaded themselves. "Yeehaw! Now that was a trip!" "You kin say that agin cuz!" "Where's the food? Lead me to the apple pies!" The Apple family had arrived at the Grand Galloping Gala. Applejack hopped down from one of the wagons, grinning from ear to ear. She had taken Twilight's invitation for her to invite her family to the letter. Never had so many Apples attempted to visit such a classy affair. Of course all of them had done their best to appear the part. Fancy outfits abounded along with freshly groomed coats, and brushed manes and tails...for thr most part. "Apple Bloom? You comin' sugarcube?" She was so proud of her little sister. This was going to be her first gala! Abby had grown up so much. Not only did she have her cutie mark now, but she was fast turning into a grown mare. "A'm really lookin' forward tah gettin' tah share this special night with you sis!" She hooked her sister into a side hug. "A'm so proud of you!" Applejack turned to the wagons. "Alright Apples, let's show em' how a gala should be done!" 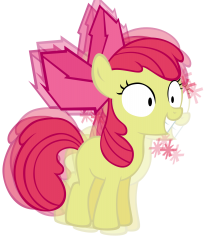 So Applebloom has been fed too many sugary sweets by Pinkie pie. AND HAS BECOME CAFFEINATED. If you've ever wondered "What would happen if you slipped Apple Bloom some caffeine?" This is the answer. Hello, my name is Appletwist. About Myself: I live in Denmark, and I love doing parkour, gaming and drawing etc. How I found Canterlot.com: NeilWacaster How I became a fan of MLP:FiM: One of my friends got me into it, eventhough it didn't seem like my thing, because I had the picture of a 3rd generation pony in my head. My favourite main cast pony/s: AppleJack Hello Canterlot! My name is Appletwist, and I am a hard working earth pony. My skin is a light blue color, mane is a mix between dark brown and light brown. My cutie mark is a root from an apple tree, with a green outline. I work at the famous Sweet Apple Acres, where I buck apples and make wooden figures. I also meditate alot, to keep my spiritual self going. Applejack puffed as she scooped apples from off the ground to the closest harvesting pale. "Babysit? Nao!? When there's a swarm of hungray caterpillars headin' this way. I gotta get all these apples picked before they get swarmed on!" Applejack's regrets to the Cake's couldn't really be heard well. But her intention was not to sound selfish. After all, there wasn't much more important to her than the well-being of the apple orchard. Except family. But Applejack was sure that somepony would help them, and since Applejack was a dependable family oriented pony, she was pretty sure she was one of the first the Cake's asked. As the Cake's left saddened by Applejack's regrets, the orange mare noticed a bouncing Pinkie following them. I sure hope if they ask Pinkie she knows what she's doing. Applejack, rushed a pair of harvesting saddlebaskets full of apples to the barn door. She kicked open the door and threw the apples into the barn and shut the door. Winded, Applejack knew that as long as the apples were in the barn, there was no way the caterpillars could get to them. The barn was well made and designed to keep critters of all sizes out. However, Applejack also knew that in order to get all of the apples that were currently on the tree into the barn, she and her brother would have to work extra fast and hard all day and since she hadn't seen Big Mac yet, she was getting a little annoyed with his absense. "Big Macintosh!? Where in tarnation are you at!? We need to get these apples off these trees pronto!" Applejack stamped her hoof as she shouted at Big Macintosh's window.